The second Research to Public workshop took place on 28th February 2013 in the Kinaris Lecture Theatre at the Manchester Museum with a great mix of researchers and representatives from cultural organisations in attendance. The aim of the day was to discuss how researchers and cultural partners can better work together and to hear case studies, from both perspectives, of working together on cultural engagement/public engagement projects. The day began with an icebreaker exercise focussing on the meaning attributed to certain words associated with public and cultural engagement. 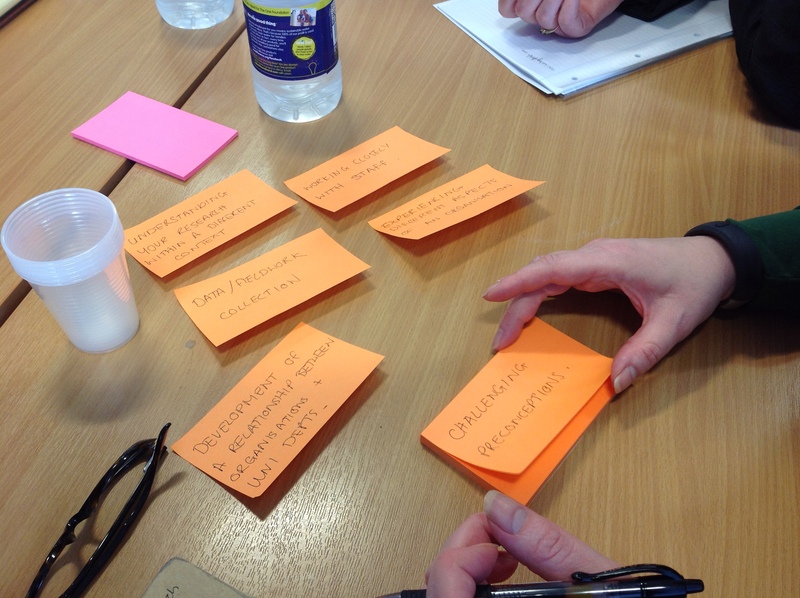 Everybody had the opportunity to pick a word and discuss what it meant to them – words such as “heritage”, “communication”, “impact”, “community” and “collections” were included. Henry McGhie, Head of Collections and Curator of Zoology at the Manchester Museum (above) started the day’s talks with a fantastic account of the museum’s collections and the development of the Living Worlds gallery which opened in 2011. Henry spoke of the importance of engaging visitors with research and debates. His account took in the history of the collections and the involvement of Thomas Henry Huxley in engineering the University/Museum partnership, including a diagram, dating back to 1868 showcasing the public gallery and curator space. These designs were pivotal in establishing the museum as a social, as well as an intellectual, space. Henry also discussed the University’s third strategic goal, social responsibility, and how the museum contributes to the promotion of understanding between cultures and working towards a sustainable world. Finally, Henry drew on the potential of collections and for cultural organisations to connect with the public through emerging technology, such as tablets and smart phones, and to collaborate with researchers – ensuring that each partner plays an important part in the process. Henry’s talk was followed by a great presentation by Antonio Benitez (above), PhD Researcher at the University of Salford (Antonio’s slides can be accessed at the bottom of this post). 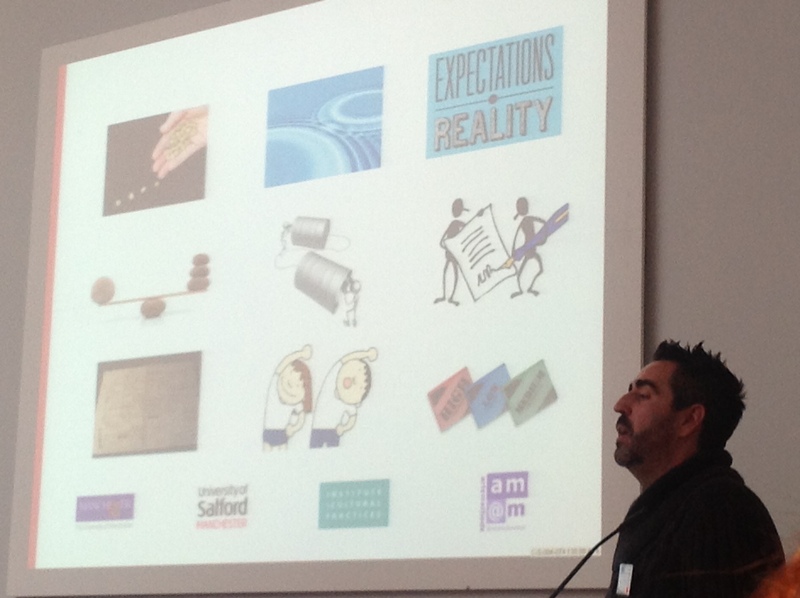 Antonio’s presentation focussed on a researcher’s perspective of University-museum partnerships. 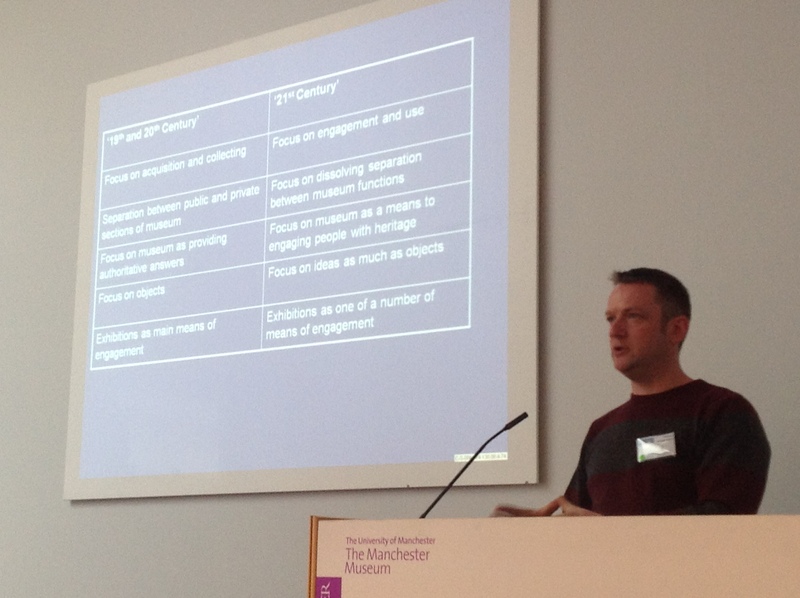 Antonio’s research focusses on older audiences (post-75) and their engagement with museums and his work has involved cross-institutional collaborations with a number of cultural organisations across Manchester. Antonio views these partnerships as an excellent opportunity to learn about developing projects with older people. Antonio’s talk considered the many benefits of working with cultural organisations such as offering networking opportunities, insight, clarity, the development of ideas etc. The most important feature of collaborations is to ensure that the expectations of both partners is realistic – both in terms of expectations and responsibilities. 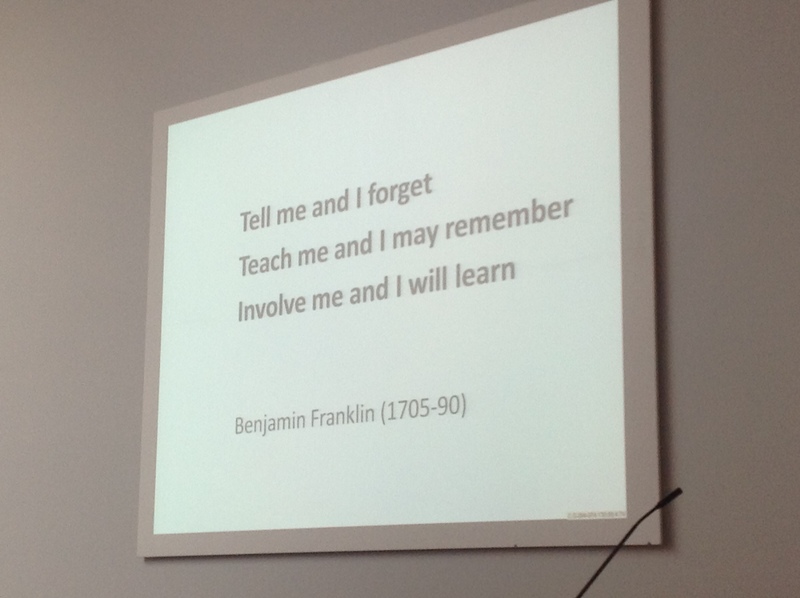 Antonio’s talk was followed by Esme Ward’s presentation on Public Engagement and Audiences which included an excellent quote from Benjamin Franklin (see title photograph). Esme focussed on the importance of involvement in learning, drawing on current research and expertise to understand what is happening in cultural spaces. Esme’s talk went beyond the Humanities and considered the importance of science communication, moving from the “chalk and talk” to a more experiential form of learning. She emphasised that researchers have the necessary skills and knowledge to engage large numbers of school audiences with their work, and acknowledge the immense value of this social form of learning and interaction. Esme also touched upon the importance of practitioner research, highlighting that researchers can challenge museums to think differently (and vice versa). After lunch, participants were divided into two groups. The first group consisted of those who had a working proposal already (some of whom were accompanied on the day by their cultural partner). They were tasked with fine-tuning their ideas by reflecting and critiquing. The second group consisted of researchers and cultural partners who had not yet partnered up. The aim of the session was to broker potential partnerships and to present back ideas on what works well and what might not work so well when researchers and cultural partners work together. 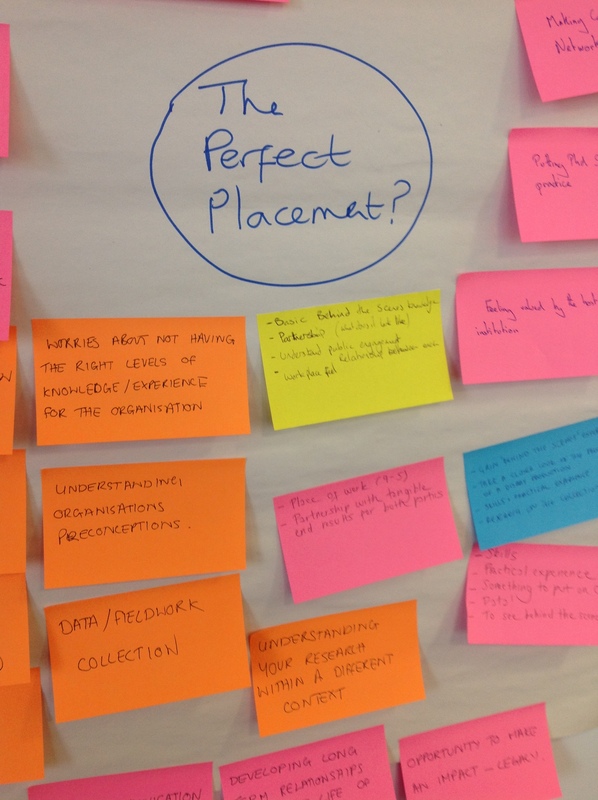 Suzanne Spicer presented a great document about “finding the right people” for partnerships which can be downloaded here: Reflecting on Your Planning Proposal.